Each year, since 2011, FEP honours one of its distinguished graduates with the Career Award, granted to an alumnus who has stood out in their career and civic life and, in so doing, has made a positive contribution to the School's reputation as an institution of excellence in Economics and Management teaching and research. The Award is an expression of FEP's pride in one of its own and of its gratitude for the winner's contribution, as mentioned, to the school's prestige. The Award is allocated by a committee formed for the purpose. All FEP alumni have the opportunity to nominate candidates for the Award. The decision is made according to the terms of the Regulations approved by Rectory Order. Ricardo Fonseca started his career, in 1972, as the internal auditor of the International Telegraph and Telephone (ITT). In 1976 went on to lead the Internal Audit of the Olive Group/Rabor, as well as the credit control of Oliva-industries. That same year he joined the Board of Management of the STCP- Collective Transport service and, later, the Board of Directors of STCP-Sociedade de Transportes Coletivos. In 1990 he became Adviser to the Government of Macau and Vice-President of Macau Television (TDM) and, in 1992, the STCP’s General Director. He assumed the position of Chairman of the Board of Directors of Portos do Douro e Leixões (APDL), from 1996 to 2008, and during this time he also chaired the Associação dos Portos de Portugal (APP). In 2008 he was appointed Chairman of the Board of Directors of Metro do Porto, as well as of its Executive Committee. Currently, besides being the President of ANECAP, Ricardo Fonseca is also a member of the Board of Associação Comercial do Porto. The award jury was composed of the Dean of FEP (who presided, without voting rights), the President of the FEP Representatives Council, João Loureiro, by the President of the FEP Alumni Association, Carlos Nunes, and by five FEP alumni: Manuel Ferreira da Silva, Guilhermina Rêgo, João Ricardo Moreira, Luís Filipe Cardoso da Silva e Paulo Alexandre dos Santos Ferreira. 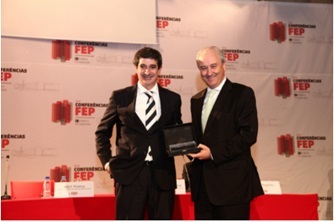 The award was presented to Ricardo Fonseca by the Dean of FEP during FEP Day, which took place on 28 May 2018. Fernando Teixeira dos Santos, Professor and alumnus of the School of Economics and Management of University of Porto, is currently serving as President of the Executive Commission at Banco BIC. He graduated with a bachelor's degree in Economics in 1973 and began lecturing at FEP that same year, where, in addition to teaching, he began publishing and overseeing academic works in the areas of Macroeconomics and Economic History. He was also President of the Scientific Council and Vice President of the Directive Council at FEP between 1992 and 1995. He furthermore founded and directed, between 1993 and 1995, the Centre for Macroeconomic and Forecasting Studies (CEMPRE). In 1995 he was named Secretary of State of the Treasury and Finance, a position he held until 1999. In 2000, he became President of the Directive Council of the Portuguese Securities Market Commission (CMVM). Between 2000 and 2004 he served as President of the IOSCO (International Organisation of Securities Commissions) Executive Committee, and from 2004 to 2005 as President of the Regional IOSCO Committee. He was also President of the Iberoamerican Securities Markets Institute (IIMV) from 2003 to 2005. In 2005 he was nominated State Minister of Finance, also taking on the duties of the Ministry of Finance and Economics and Innovation between July and October 2009. In 2009 he was reappointed State Minister of Finance, holding that office until 21 June 2011. In 2005, he was honoured with the title of Grand Officer of the Order of Prince Henry the Navigator, and in 2015 with the Great Cross of the Military Order of Christ. He also won the Annual Department Award for Outstanding Academic Performance by a Graduate Student and Distinguished Alumnus Award from the University of South Carolina, where he earned his Ph.D. in Economics. The award jury was composed of the Dean of FEP (who presided, without voting rights), the President of the FEP Representatives Council, João Loureiro, by the President of the FEP Alumni Association, António Monteiro, and by five FEP alumni: Carla Chousal, Daniel Bessa, Elisa Ferreira, José Alves and Manuel Ferreira da Silva. 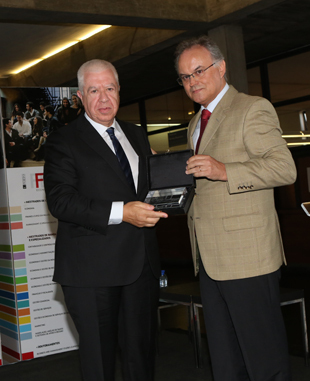 The award was presented to Professor Fernando Teixeira dos Santos by the President of the FEP Representatives Council during FEP Day, which took place on 29 May 2017. Francisco de Olazabal is responsible for the management of the Quinta do Vale Meão, in Vila Nova de Foz Côa. Holding a Bachelor's in Economics from FEP, the businessman and manager was the Managing Director of the Constantino Society of Port Wines, Deputy of the Board of A. A. Ferreira, S.A. (Casa Ferreirinha) and President of Ferreira, a family company in the sector of Port and Douro Wines. He held positions in various companies of the Sogrape group between 1987 and 1998 and bought the Quinta do Vale Meão with his children in 1994. The vineyard was founded by the great-great-grandmother Antónia Adelaide Ferreira (Ferreirinha), at the end of the 19th century. After 1998, he dedicated himself to the creation and commercialization of wines from the Quinta do Vale Meão vineyard through the F. Olazabal & Filhos, Lda. company. The first DOC Douro (Quinta do Vale Meão e Meandro) wines were launched in 2001. The wines earned a place in the Top 100 list of the American magazine Wine Spectator on five occasions and, in 2014, Quinta do Vale Meão Douro 2011 wine earned fourth place in that ranking. He took on various roles in Associations and Bodies of the Wine Making sector, such as the Association of Exporters of Port Wine (AEVP) and the Port Wine Brotherhood, and was also President of the Board of the Oporto Golf Club. Francisco de Olazabal was named Grand Officer of the Order of Agricultural Merit in 2004 by President Jorge Sampaio. In 2010, he was granted a Doctor Honoris Causa degree by the University of Trás-os-Montes and Alto Douro. The award-granting committee consisted of the following members: Dr. José Manuel Varejão, Director of FEP who presides without the right to a vote, Dr. João Loureiro, President of the FEP Representatives Council, Dr. António Monteiro, President of the FEP Alumni Association, Dr. Elisa Maria da Costa Guimarães Ferreira, Dr. António Manuel Paranhos Ferreira da Silva, Dr. Odete Maria Alves da Silva Patrício, Dr. Rui Manuel Rego Lopes Ferreira (did not participate in the vote due to being absent abroad) and Dr. Sandra Maria Soares dos Santos. 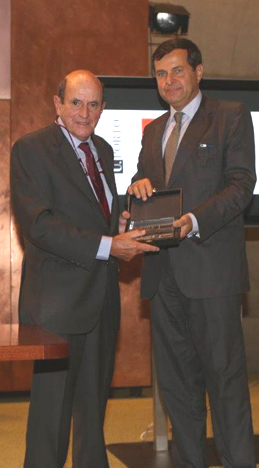 The Award was presented to Dr. Francisco Olazabal by Dr. Manuel Ferreira da Silva, manager of BPI and FEP alumnus, during the solemn opening session of the academic year that took place on October 13th, 2016. Miguel Cadilhe is currently the President of the Council of Curators of the University of Porto. He graduated with a bachelor's degree from FEP in 1968 with the highest marks of that year and, in 1977, joined the School's Re-Structuring Commission on nomination by the Portuguese Government. He was also a professor of Macroeconomics, Statistics, Econometrics, Financial Mathematics, Operational Research and other disciplines at FEP. Between 1981 and 1982 he researched macroeconomic policy at the London School of Economics. He was awarded the great crosses of the Orders of Merit of Portugal and the Southern Cross of Brazil and the Medal of Honour, gold level, of the city of Porto. He received the career award from the Order of Economists in 2015 and has published various books and articles on issues of national interest. The award-granting committee consisted of the following members: Dr. José Manuel Varejão, Director of FEP who presides without the right to a vote, Dr. João Loureiro, President of the FEP Representatives Council, Dr. António Monteiro, President of the FEP Alumni Association, Dr. Elisa Maria da Costa Guimarães Ferreira, Dr. António Manuel Paranhos Ferreira da Silva, Dr. Odete Maria Alves da Silva Patrício, Dr. Rui Manuel Rego Lopes Ferreira and Dr. Sandra Maria Soares dos Santos. 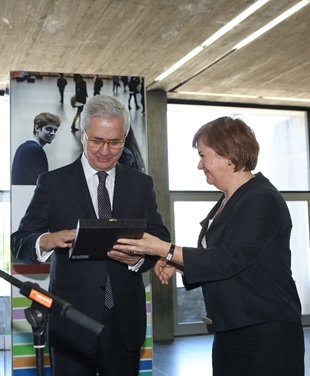 The Award was presented to Professor Miguel Cadilhe by Dr. Odete Patrício, Director-General of the Serralves Foundation, during the FEP Day commemorative session on May 31st, 2016. He graduated with a bachelor's degree from the School of Economics and Management of the University of Porto (FEP), where he taught since February 1975. His professional career began in 1965 when, at age 15, he began working at the Salvador Caetano group, a company he continued to work for during university and which he left as Chief of Accounting to begin teaching at FEP. His curriculum includes turns through the management branches of over a dozen institutions, from banking to insurance to other sectors including health and real estate. At the end of the 90s he presided over the management of the Society of Collective Transportation of Porto, which later led to a management position within the Metro of Porto until 2000, when he was nominated president of the executive commission of the same company. He received his doctorate in Business Finance in Scotland, despite never being exclusively dedicated to an academic career. The award-granting committee consisted of the following members: João F. Proença, as Director of FEP, Ana Paula Africano, as Deputy Director of FEP, Manuel Ferreira da Silva (BPI and FEP), Luís Sítima (Hay Group), José Nogueira da Silva (McKinsey & Company), José Pereira Alves (PwC), Francisco Sousa Pimentel (Sonae), Álvaro Almeida (FEP), Elísio Fernando Moreira Brandão (FEP) and Paulo Teles (FEP). 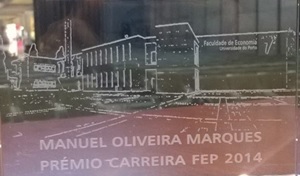 The Award was presented to the family of Manuel Oliveira Marques by Dr. Manuel Ferreira da Silva, manager of BPI and FEP alumnus, during the solemn opening session of the academic year that took place on October 15th, 2015. Elisa Ferreira is currently on the Board of Directors at Banco de Portugal. She graduated with a bachelor's degree in Economics from the University of Porto (1977), where she also began teaching in 1977. She was a Member of the European Parliament (2004-2016), serving on the Commission of Economic and Monetary Affairs throughout her appointment and in which she was, most of the time, the coordinator (spokesperson) of the Socialist and Democratic Parliamentary Group. She was part of the First and the Second Special Commissions on Tax Rulings and Other Measures Similar in Nature or Effect (TAXE), the Financial Assistance (to Euro countries) Working Group, the Special Committee on the Financial, Economic and Social Crisis and the Special Committee on Policy Challenges and Budgetary Resources For a Sustainable European Union. She was the reporter (coordinator) of the positions of the European Parliament on various legislative proposals related with the financial system and matters of economic, budgetary and fiscal policy. Before joining the European Parliament, she was a member of the National Assembly (2002-2004), Minister of Planning of the 14th Constitutional Government (1999-2002) and Minister of the Environment of the 13th Constitutional Government (1995-1999). She was also the executive vice-president of the Porto Industrial Association (1992-1994) and vice-president of the Coordination Commission of the Northern Region (1998-1992), which she joined in 1979. Between 1989 and 1992 she was a member of the Administration Council of the National Institute of Statistics. She was honoured with the Great Cross of the Military Order of Christ in 2005. The award-granting committee consisted of the following members: João F. Proença, as Director of FEP, Ana Paula Africano, as Deputy Director of FEP, Elísio Brandão (FEP), Álvaro Almeida (FEP), Paulo Teles (FEP), Manuel Ferreira da Silva (BPI), Luís Sítima (Hay Group), Francisco Pimentel (McKinsey & Company), José Pereira Alves (PwC) and Paulo de Azevedo (SONAE). 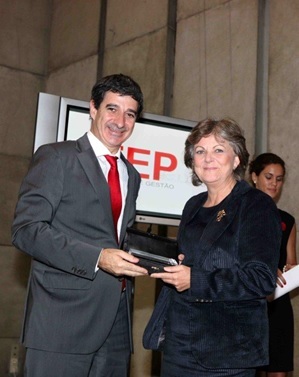 The Award was presented to Elisa Ferreira by the then-Director of FEP, João F. Proença, during the solemn Opening Session of the Academic Year on October 10th, 2013. Rui Rio graduated from FEP with a bachelor's degree in Economics. As a student, he was President of FEP's Student Association and member of its Pedagogic Council. In 1982 he gained his first professional experience as an administrative and financial adviser within the management of a commercial company essentially linked to the textile industry, a function that was interrupted for him to complete compulsory military service but resumed in 1985. An economist at the Banco Comercial Português by the end of the 80s, he collaborated on the implementation of the Capital Market Management, focusing his activities on setting up financial operations in the primary market, admission processes for Stock Market listings and the study and conception of new financial products. He was later the Financial Director of CIN - Corporação Industrial do Norte, S.A.
At the same time, Rui Rio undertook intense political activity. He began in the JSD, where he was Vice-President of the National Political Commission between 1982-1984, serving simultaneously as a Member of the National Political Commission of PSD, during the presidency of Pinto Balsemão and later Mota Pinto. Later, as a deputy to the National Assembly for the Porto constituency, he had special intervention in the Parliamentary Commission on Economics, Finance and Planning, between 1991 and 2001. During this period, he served as Spokesperson for the "orange" section on economic and financial matters, he was Secretary-General of the party during the presidency of Marcelo Rebelo de Sousa, and he was also Vice-President of the Parliamentary Group. Between 1996 and 1998 he was the Vice-President of the Sá Carneiro Institute. He was also Vice-President of PSD, under the presidencies of Durão Barroso, Pedro Santana Lopes and Manuela Ferreira Leite. From 2003 to 2005 he was President of the North-eastern Peninsular Atlantic Axis. He was elected Mayor of Porto in 2002 and was re-elected in 2005 and 2009, serving until 2013. He also presided over the Porto City Council and APOR and served as non-executive administrator of the Metro do Porto between 2002 and 2010. He was honoured with the Great Cross of the Order of Infante D. Henrique by the President of the Republic of Portugal, Aníbal Cavaco Silva, and with the Great Cross of the Order of S. Gregório Magno by His Holiness Pope Benedict XVI. He was furthermore awarded the Great Cross of the Orders of Merit of Hungary and the Kingdom of Norway, with the Great Cross of the Order of Honour of the Republic of Austria, with the Great Cross of First Class of the Order of the White Star of the Republic of Estonia and with the Commander's Cross of the Order of Merit of the Republic of Poland. The award-granting committee consisted of the following members: João F. Proença, as Director of FEP, Ana Paula Africano, as Deputy Director of FEP, Cláudia Ribeiro (FEP), Artur Vieira (FEP), Elísio Brandão (FEP), Álvaro Almeida (FEP), Rui Henrique Alves (FEP), Manuel Ferreira da Silva (BPI), Francisco Pimentel (McKinsey & Company), José Pereira Alves (PwC) and Paulo de Azevedo (SONAE). 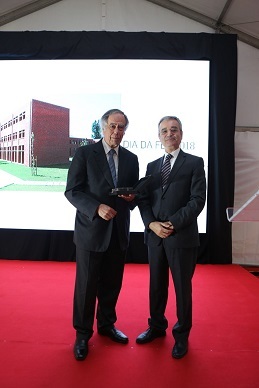 The Award was presented to Rui Rio by the then-Director of FEP, João F. Proença, during the solemn Opening Session of the Academic Year on October 31th, 2012. He graduated with a bachelor's degree in Economics from FEP in 1970, where he also taught from 1970 until 1999, and again from April 2009 onwards. He also taught at the School of Engineering (1989-1992), at the ISEE - Higher Institute of Business Studies (1988-2000), at EGP - Escola de Gestão do Porto (2000-2008) and at EGP – University of Porto Business School (June 2008 to March 2009). Still within the realm of education, he was President of the Directive Council of FEP (1978-1979), President of the Founding Committee of the Higher School of Technology and Management of the Viana do Castelo Polytechnic Institute (April 1989 to December 1990), Vice-Rector for the orientation of the financial management of the University of Porto (December 1990 to October 1995), Executive Directer of AURN - Association of Universities of the Northern Region (1996-2000), President of the Administration of EGP - Escola de Gestão do Porto (June 2000 to June 2008) and President of the Administration of EGP - University of Porto Business School (June 2008 to March 2009). In terms of business, in June 2009 he headed General Management of COTEC Portugal - Business Association for Innovation. He became a non-executive Administrator of Efacec Capital, S.G.P.S., S.A. in May 2004 and of the Agency for Investment and External Trade of Portugal - AICEP, E.P.E., in November 2007. He worked with private companies and groups, public entities, regional and sectoral economic associations, syndicates, schools and other entities (namely Sonae, Grupo Amorim, Siderurgia Nacional – Serviços, Government of the People's Republic of Angola, Regional Government of the Azores, Coordination Commission of the Northern Region, ACSS – Central Administration of the Health System, Estrutura de Missão Parcerias-Saúde, ARS Centro – Regional Administration of Health of the Centre, Vila Nova de Gaia Central Hospital, City Hall of Porto, City Hall of Funchal, City Hall of Vila Nova de Gaia, Vale do Lima Municipal Association, Vale do Minho Municipal Association, ATP – Textile and Garment Association of Portugal, APICCAPS – Portuguese Association of Shoe, Component, Leather Product and its Substitutes Industries, APIM – Portuguese Association of Fabric Production and Manufacturing Industries, AIMMP – Association of the Wood and Funiture Industries of Portugal, ANCEVE – National Association of Vendors and Exporters of Wine and Spirits, Bankers' Syndicate of the North, CLIP – Luso International Private Primary School of Porto, COTEC Portugal, among others). His political activities must also be highlighted, having served as Minister of Economics of the Portuguese Government (October 1995 to March 1996) and elected member of the Portuguese National Assembly (October 1995). He was also the Spokesperson of the Socialist Party for economic and financial matters (December 1992 to October 1995) and Person In Charge among the Ministries of Economics, Social Security and Work of the Portuguese Government to coordinate the creation of the Programme for the Recovery of Depressed Areas and Sectors (February 2003 to June 2004). The award-granting committee consisted of the following members: João F. Proença, as Director of FEP, Elísio Brandão (FEP), Luís Vasconcelos (FEP), Manuel Costa (FEP), Paulo Teles (FEP), Pedro Teixeira (FEP), Álvaro Portela (External Member of the FEP Representatives Council) and Manuel Paranhos Ferreira da Silva (External Member of the FEP Representatives Council). 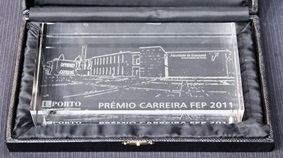 The Award was presented to Fernando Teixeira dos Santos (upon request of the winner, who was not in Porto), by the then-Deputy Director of FEP, Ana Paula Africano, during the solemn Opening Session of the Academic Year on October 20th, 2011.